I’ve only been to two musicals in all my life. 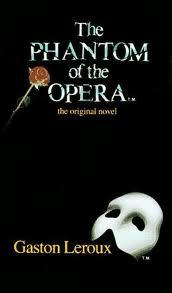 There are several I wish to see someday, and The Phantom of the Opera is surely one of them. I was never curious to read the book until I chanced upon it and I decided to read it on a whim. After all, a popular musical would be well worth reading as a book, right? Absolutely, yes. I can perfectly understand how this can be a powerful and mesmerizing musical, and I can’t wait to see it someday. The story is about the mysterious Opera ghost who seems to haunt the walls of the Paris Opera House, wreaking havoc among the managers, the audience and the opera performers with his supposed witch-crafts and threats. The disruptive activities of the phantom come to the glaring spotlight when the alluring singer, Christine Dae gets entangled in his tentacles. The phantom calls himself the Angel of Music, and helps Christine with her singing lessons. Surely, the phantom is ingeniously talented in music and has the rapturous voice of an angel. But the rest of him is shrouded in a dark, deathly shadow. The story is about dissecting who the phantom is, if he really does exist, and how the poor, innocent singer is rescued from his grips. The book has a lot of elements running through it - mystery, suspense, romance, and a Gothic flavor that heightens the tension and tragedy. I have realized that books which capture all of these elements leave the most impact on me. Plus, books that deal with an interesting plot surrounding an intense character keep me totally consumed and engrossed. I love intense, over-the-edge kind of plots based on the human psyche - it both fascinates and horrifies me. It’s perfect to sink into the story and analyze one single character who portrays the most devious and brilliant mind. It’s a pity I can’t ramble on about anything else, for I will be spilling the mystery and spoil the book for those who want to read and learn things by themselves. But the book touched me. I thought it was brilliant that the author came up with such a haunting psychological thriller surrounding a conventional Opera house. It leaves you wondering who the real victims in the book are, and indeed how shallow our perceptions of physical appearances really are. Seems v interesting! I wasn't aware of the book version. Am definitely adding this to my list.